Sepsis is a common condition. Each year, more than 1.7 million people in the United States are diagnosed with sepsis, and more than 270,000 die. Sepsis can be missed in the early stages if doctors and nurses aren’t looking for it and many sepsis survivors say their illness wasn’t noticed when they first sought help either in a hospital emergency department or doctor’s office. For some, it wasn’t noticed during subsequent visits either. A missed sepsis diagnosis is a medical error and being an advocate for one’s own health is the first step in helping prevent such errors. This is why Sepsis Alliance is pushing for greater sepsis awareness among both the general public and healthcare professionals. Sepsis Alliance is a committed partner of the Patient Safety Movement Foundation with a goal to reach zero preventable deaths in hospitals by 2020 (0X2020™). It wasn’t that long ago when most patients didn’t question healthcare professionals. The prevailing attitude was that they were the experts, so they should know what to do. 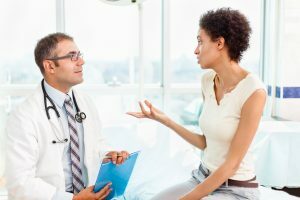 In fact, there are still people who are reluctant to ask their doctors questions, fearing that they may be labelled trouble-makers or difficult patients. But by working together with your doctor, asking questions and ensuring you understand the responses, you could reduce the risk of more serious illness and it could save your life. Here is how you can help your healthcare team diagnose and treat you effectively. Tell your story as accurately as possible. Keep a record of your symptoms and any pertinent medical history. For example, if you have a fever and rapid heart rate, what happened before that? Did you have surgery? Did you go to the dentist? Did you scratch your arm? Did you have pain in your stomach that went away? Did your child have the flu recently? Detail anything that could be connected to your symptoms. The more information your doctor has to work with, the better. Ask someone to stay with you when you speak with your doctor. When you’re sick or anxious, it’s easy to forget to relate an important detail or forget that you were told something. A second person can help you keep track of all the information. In fact, the worse you feel, the more important it is to have someone with you who can be your advocate. If you’re concerned about sepsis, say it. Say, “I’m concerned about sepsis,” and explain why. Ask for clarification if your doctor says something you don’t understand. If you are sent for tests, ask what they are for and when the results will be available. If you are to go home to wait for results, don’t assume that no news is good news. Follow up if you haven’t heard back by the time you expected to. Ask your doctor what you should expect following your diagnosis. For example, if your doctor says you have a virus, ask how long it should typically be before you start feeling better. Ask what you might expect and what signs or symptoms to watch for that would indicate that you are getting worse, not better. If you have been prescribed medications, ask what they are for, what they are supposed to do, and when you should start seeing their effects. When you get your prescription filled, ask your pharmacist if there is anything specific you should watch for with the medications, including side effects. Pharmacists are the medication experts. Keep your own records. Note down what was said and what you did. This way, if you must return to your doctor or you go to a clinic or emergency department, you have this information at your fingertips. Get a second opinion if you feel that you are not getting better. And if you are worried that you have sepsis, seek a second opinion as quickly as possible. A healthcare team can be composed of many people, from doctors and nurses to therapists, but the most important member of the team is you, the patient. It’s Patient Safety Awareness Week from March 11 to 17. Your input and participation in your own health care is vital in reducing the risk of errors and increasing the likelihood that your treatment plan will be successful. Learn more about sepsis at our FAQ page, and help spread the word about sepsis.